What May be Causing Your Business’s Roof to Leak? Commercial buildings typically have flat roof systems, which have different features and properties than sloped roof. However, both types have good performance, contrary to the popular myth that flat roofs are more prone to leak. First, this roof type is not exactly flat. It is designed with a small angle of inclination, invisible to the eyes, and the construction is planned in such a way that there are no problems in water evacuation. 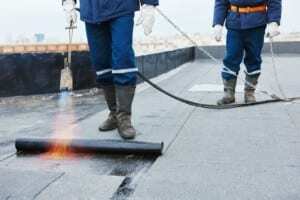 Modern flat roof systems have many unexpected benefits and when such a roof leaks, the cause is not related to the roof being flat, but to other problems. Flashing represents a vulnerable roof area, regardless the type of the roof. It must be inspected periodically to ensure that is in good shape and still provides good protection. It must be replaced as soon as it is damaged, otherwise it will allow water to penetrate in the roof system. The membranes installed on flat roofs are resistant, but they age, just like any other material. In time, your business`s roof may crack, shrink or puncture, leaving the insulation exposed. Obviously, the water will find a way in. An old membrane that reached the end of its lifespan must be replaced. In this case you will want to employ reliable commercial roofers in Denver to complete roofing service repairs. This is mainly caused by a drainage problem, so if rainwater remains on the roof for more than two days, you must take action, or you risk water leaks.